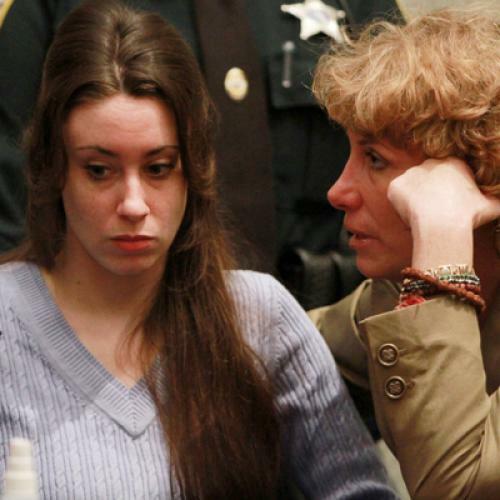 As the prison term of Casey Anthony drags on, now until July 17, is there time to reflect? On the day of her verdict, last Tuesday, she looked as nervous as any of us might have felt. She was in trial mode, in a drained pink shirt, her brown hair drawn tightly back and restrained in a pony-tail. Her dark eyes stood out, but she held herself together. No one doubts her nerve. Then, by Thursday (sentencing day), the hair was down on her shoulders. It stirred. She was prettier, and more confident—wasn’t she? Her sweater was sky blue. Was her lipstick stronger? Who can be sure? Who really has the time to keep a measured scrutiny of such things? Millions do. What does a heavily unemployed nation do in summertime as the debt ceiling hovers and our modern Portia—Nancy Grace—whips up the mob and her viewing figures? (At verdict time, Grace’s HLN network viewing rose by 1,700 percent.) When the verdict came down, Grace let us know her opinion, that “the devil was dancing in the streets tonight.” That came just after her admission that, of course, the verdict is to be honored. OK, but how long can it be before sprawling movies like this earn built-in audience feedback? We know from “American Idol” and other shows that fixed jurors are all very well, but doesn’t American justice deserve a common response? If a viewer watched 75 percent of the trial (it’s a simple electronic measurement), isn’t he or she entitled to a thumbs up or a thumbs down? I honor the verdict, too, just as I would have lived with complete exoneration or, “This way to whatever method of execution Florida favors at the moment.” The point about the jury system is to respond with respect, not intelligence. So jurors should be chosen at random. If unusual education, eloquence, or expert knowledge get jurors dismissed (and they often do), there is no better system than chance selection. So, once we’ve accepted the verdicts, and acknowledged that the state fell so far short of proving first-degree murder they should not have charged it, still, “aggravated child abuse” sticks in the throat. The state of Florida insists on physical abuse. That’s how educational systems skate by: Their neglect seldom leaves scars or bruises, just dullness and diminished hope. So be it. Perhaps we need a fresh statute for a parent who does not report (or notice) a disappearance, and then gives the law fraudulent answers that must impede the investigation. A fresh-faced authority called on by CNN said that at least the trial was transparent. Not the one I watched, which became more opaque as pious experts did their paid bit and attorney Jose Baez delivered a final speech for the defense so emotional, so confusing, so clever, that it nearly wiped out the memory of all he had promised in his opening statement—the accident that snowballed, that was never addressed in evidence, because Casey, the accidental mother, exercised her constitutional right in not speaking. Guess now, if you will, which TV show she will speak to, and how much money she will get—enough to cover her $4000 fines? Did anything emerge well from this turgid frenzy? Yes, it was Judge Belvin Perry, who seemed to see the horrid likelihood that he might become a TV personality and eroded that threat by being steadfast, professional, and bored. We have seen other judges grasp their 15 minutes, or weeks. Perry was what we would like to be made of, and his is the only post-coital interview I would care to hear. Of course, he will not stoop to offer it. If you heard him utter the name, “Caylee Louise Anthony,” you know the man and his decency already. By the way, Caylee is dead—and her death might have kept her mother’s hair restrained at sentencing. Like fireworks (I am thinking July 4, deliberation day for the jury), the trial was riveting and pointless. As such, it’s what we now demand of “news”: hold us, then let us go. So, the Anthony trial is in the pattern of the disaster in Japan (you must remember that? ), the action in Libya, the stirrings of something in Egypt, or the collapse of the economy. In such times of stress, melodramas like that of the Anthonys are pacifiers that fill our roof-space (also known as our heads) like styrofoam. The only purpose of putting trials like these on-air is to cater to the TV networks that use them to fill their time. The principle of legal education is no better served by six weeks of this than it is by 30 minutes of the ranting Queen of Hearts called Judge Judy. It is tabloid television, despite the detachment of a camera style that purports to observe or record without bias. The horror of what happened in the Anthony family is a petty novelette, best granted privacy. It is enough that a Judge Perry, court officers, and a jury have to last it out, without turning Casey into a monster who now will be at liberty. Think of Dan White and O.J. Simpson and wonder about the limits of their acquitted freedom. A longer, more infinite sentence has begun for Casey Anthony, and it may drive her mad. CNN and the others gained, and, every time I chose to eavesdrop on the court, I had to endure a dirge-like ad for Google as a portal, and the prospect of most internet and cable sites being jammed with incessant, arid chatter on the case. Watching Casey only helped reveal how far attending—attempting to be part of our world—is a drug that deadens participation and understanding. Nothing is served by such trials except bolstering these feeble channels and excusing them from reporting news. The internet has actually deterred us from that demanding project. The global village it boasts of is a prison block where the conditions of servitude are ignorance, anonymity, and indifference. As Casey Anthony starts that life sentence she’ll be looking for a make-over. And, after our latest “ultimate reality show,” can we admit that our sense of reality has been undermined in advance of the economy, the weather, and the experience of “disaster”?